Enjoy a fun-filled night at another great trivia event! Come solo or bring a group of friends and play to win great prizes. 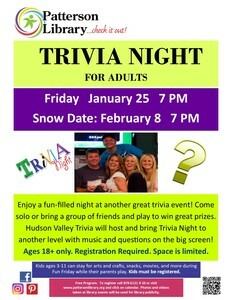 Hudson Valley Trivia will host and bring Trivia Night to another level with music and questions on the big screen! While parents play, kids ages 3-7 can stay with Miss Kathy & Miss Jane for arts & crafts, movies, snacks and more while kids ages 8-13 can play Buzztime Kids Trivia for fun prizes. Registration required. For more information or to register, contact the Patterson Library at 845-878-6121 x10 or go to www.pattersonlibrary.org and click Calendar.